This four bedroom detached bungalow presents an opportunity for either a residential or investment purchaser. The property requires a full overhaul and could simply be modernised or reconfigured. The plot also lends itself potentially to other development opportunities. This property offers real potential to any willing and able buyer. For more information or to view then call Phillips George on 01162168178. 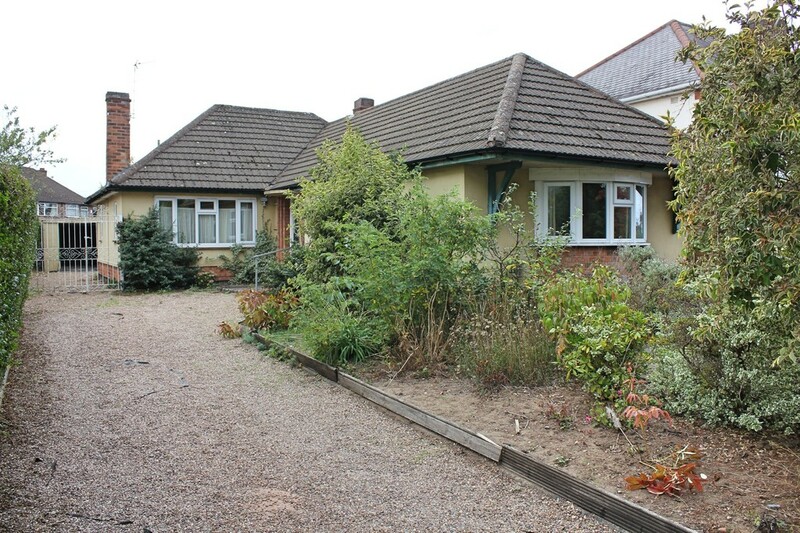 SUMMARY This four bedroom detached bungalow presents an opportunity for either a residential or investment purchaser. The property requires a full overhaul and could simply be modernised or reconfigured. The plot also lends itself potentially to other development opportunities. This property offers real potential to any willing and able buyer. For more information or to view then call Phillips George on 01162168178. ENTRANCE HALL With cupboard housing the meters, window to the side elevation, storage cupboard, tiled floor, thermostat, radiator and access to the loft. LOUNGE 17′ 9" x 11′ 9" (5.41m x 3.58m) Having original fireplace, two windows to the side elevation, two radiators, patio doors to the rear garden and window to the front elevation. KITCHEN 15′ 2" x 8′ 4" (4.62m x 2.54m) Comprising base and wall mounted units with work surfaces, electric cooker point, sink unit with drainer, tiled splash backs, wall mounted boiler, tiled floor, plumbing for washing machine, windows to the side and rear elevations, radiator and door to the side leading to the rear. BEDROOM 15′ 2" x 10′ 10" (4.62m x 3.3m) Having bay window to the front elevation, built in wardrobes, picture rail, telephone point, radiator and window to the side elevation. BEDROOM 11′ 5" max x 8′ 11" (3.48m x 2.72m) With built in wardrobes, picture rail, radiator and window to the side elevation. BEDROOM 8′ 2" x 6′ 11" (2.49m x 2.11m) Having window to the side elevation, picture rail and radiator. BEDROOM 17′ 2" x 8′ 1" (5.23m x 2.46m) Having pedestal wash hand basin, built in wardrobes, windows to the side and rear elevations and radiator. SHOWER ROOM 7′ 11" x 7′ 9" (2.41m x 2.36m) Comprising walk in shower area, pedestal wash hand basin, low flush w.c., extractor fan, tiled splash backs, radiator and two windows to the side elevation. OUTSIDE The property occupies a generous plot, both front and back. The outside space is mature throughout with trees and shrubs. There are lawned areas to the front and rear. The current owners purchase an additional piece of land to the rear of the property which adds to the plot and gives extra potential. There is a detached garage accessed via gates at the side of the property. The driveway is quite long and would provide ample off road parking.